One thing’s for sure: Up until now, 2018’s biggest trends have walked on the wild side. First there were all manner of transparent accessories; then we had teeny-tiny sunglasses, fruit-shaped earrings, and beyond-chunky sneakers. Which might explain why we’re now looking to less conspicuous, more functional styles as the year draws to a close. Think outdoor-inspired streetwear styles (hello, on-trend puffer jackets and hiking boots), only primed for winter. Enter: the OG outdoor brand, Eddie Bauer. The brand is basically the one-stop shop for this super-wearable trend that’s only just getting started. Step away from that microscopic beaded bag and see the five practical yet stylish pieces we’re picking up before the year is over. Whether you want to go extra puffy or you’re cool with sticking to the classic silhouette, puffer jackets have become a staple for fashion girls in everywhere (even in locales where the temperatures hardly call for it). And for good reason—they’re so easy to layer under more polished coats. Our advice? Go for a pop of color like a red to really make a statement. Behold the It print embraced by high-end designers and high-street retailers alike. Oversize plaid has been flooding our feeds, and we have a feeling the look isn’t going anywhere. The shearling lining makes for an ultra-cozy jacket you can wear with a turtleneck layered underneath. 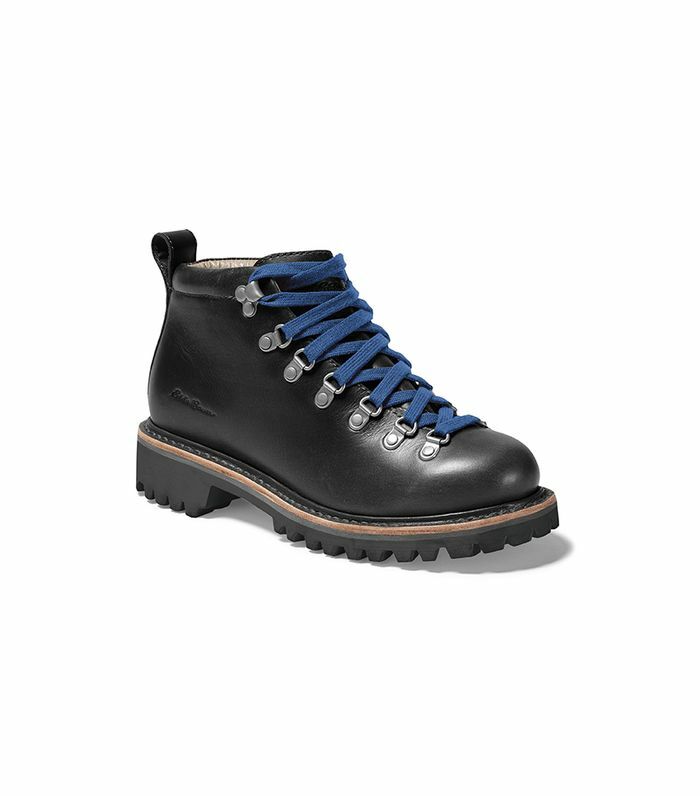 Throw on the hiking boots we showed you earlier and you have the ideal end-of-2018 look. This coat is like the puffer jackets grown-up cousin, and we're here for it. The Eddie Bauer piece has it all, from the faux-fur trim to the olive tone that goes with basically everything we own. Denim and chunky sneakers? Obviously. A printed skirt, an oversize knit, and slouchy boots? 10/10. Accessories are where you can feel free go a little crazy. If you’ve been wanting to dabble in faux fur, a great way to do it is with a pair of gloves. The fuzzy trend is right in line with teddy coats and animal-print everything, plus it’s a foolproof way to keep warm. These gloves also have touchscreen-friendly finger pads, meaning you can keep them on when it’s below 20º and you’re trying to call your Uber driver.